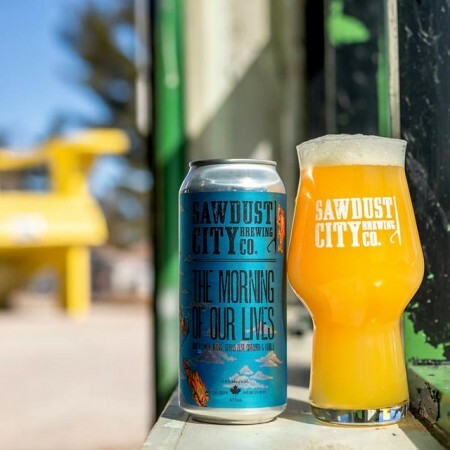 GRAVENHURST, ON – Sawdust City Brewing has announced that a collaboration with Fairweather Brewing will be the 16th of its 52 weekly beer releases for 2019. This sour, hazy IPA has loads of oats, raw wheat and is generously dry-hopped with Citra hops. It was fermented alongside Brazilian Orange Puree before being infused with orange zest, lemon zest, cinnamon, and vanilla. This beer is big yet soft, juicy, tart, and refreshing. Ending up with flavours that fall somewhere between a mimosa and an orange creamsicle, this is the perfect beer to finally carry us out of snowy days inside and onto patios with friends. The Morning of Our Lives will be available tomorrow (April 18th) at the Sawdust City retail shop and online store, as well as select beer bars in Ontario, while supplies last.